No question about it, canines are smart and adaptable. In recent posts, we’ve featured a dingo who cleverly figured out how to use a table as a tool enabling him to reach tempting food, described research suggesting that dogs may be so in tune with our feelings that they can catch yawning bouts from us, highlighted evidence that humans and dogs may be undergoing cognitive convergent evolution with each other based on our close social relationships over the millennia, and even noted a study pointing to canine self-awareness based on their recognition of their own, er, yellow snow. Also, dog owners frequently describe how smart their cold-nosed friends are, how they know the words for large numbers of toys and other objects, and how they understand and sometimes obey numerous commands. (Good dog!) However, while there have been many studies investigating the linguistic abilities of primates, cetaceans, parrots and certain other species, there has been surprising little formal research into the verbal comprehension of dogs. Dogs have been tested for their understanding of specific words and commands, but there has been an absence of research into whether they can understand and distinguish the constituent parts of complex sentences that refer both to objects (e.g., “ball,” “stick” or “newspaper”) and to actions (e.g., “fetch,” “roll over,” or “point”). First, in 2011, John Pilley and Alliston Reid published a paper in Behavioural Processes detailing a variety of word comprehension tests that they had given to Chaser, a rock star border collie famous for knowing the names of over 1,000 objects. In one of these experiments, Pilley and Reid tested whether Chaser could independently understand the meanings of verbs and nouns. In this test, Chaser was asked to respond appropriately when three different commands (take, paw, and nose) were randomly associated with three different stuffed cloth toys (Lips, a toy resembling human lips; ABC, a cloth cube with those letters written on its side; and Lamb, a stuffed lamb) in 14 independent trials using a double-blind procedure. Chaser was familiar with the commands, but none of the three toys had ever been paired with any of the commands prior to the experiment. 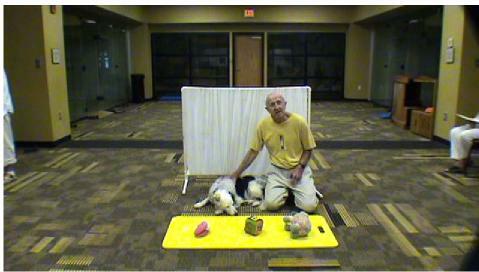 The tests were videotaped with sound recording, with three independent raters (not the experimenter or the confederate) scoring whether Chaser chose the correct toy and performed the correct command. Each rater first watched the videotape with the sound turned off (so he/she wouldn’t know which instructions had been given to Chaser), and recorded which command was actually executed towards which toy. After rating all 14 trials, the rater then watched each trial again with the sound turned on in order to assess whether Chaser’s behavior accurately matched the instructions given by the experimenter. How did Chaser do? Perfectly. These results clearly support the conclusion that Chaser understood reference – that the verbal noun of an object referred to a particular object with distinct physical features independent of actions directed toward that object. Then, earlier this month, Daniel Ramos and Cesar Ades of the University of São Paulo published a study in PLoS One that extended the Chaser research. Learn the names for four objects (ball, key, bottle and stick) and two requests (point or fetch). When presented with two objects, approach the correct object on request, or perform the correct action upon request. Perform object and action requests in sequence – that is, first approach the proper object after being given an initial “object request” and then, after being given an “action request,” perform the correct action on the object. Perform single multi-part requests – that is, after being given a compound request (e.g., ball fetch, ball point, key fetch, key point, bottle fetch and stick point), approach the correct object and perform the correct action. To eliminate the possibility of inadvertent cues from the experimenter, perform the same tests as in phase 4 but with the following control variations: (1) experimenter wearing sun-glasses, (2) experimenter with mouth covered by a cloth band, (3) research assistant absent from the room, (4) unfamiliar person as experimenter, (5) testing in an unfamiliar room, (6) test objects scattered, distant from one another, and (7) new objects of the same category (new balls, keys, etc.) offered. Perform reversed multi-part requests – that is, in response to compound requests in which the word order has been switched from object-action to action-object (e.g., fetch ball, point ball, fetch key, point key, fetch bottle and point stick), approach the correct object and perform the correct action just as in phase 4. Perform multi-part requests with a new, previously-untested object, a teddy bear. Perform multi-part requests with new combination object-action pairs (stick fetch and bottle point) that had not been used at all during prior training or tests. Our results suggest that dogs share with “linguistic” animals the capacity to encode in memory at least two heterogeneous items of information to be used in subsequent directed performance, a capacity which, although far from being “an infinite use of finite means” as human grammars are, may have comparative relevance as a forerunner to syntactical functioning. Now, I know what you are saying. 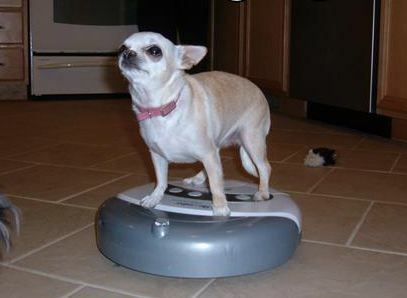 Yes, your dog can do that too. I’m aware that she consistently beats you and your friends at poker, and I’ve seen the video where she plays charades while riding around your house on a Roomba. You see, that’s actually the issue. Dogs are incredibly good at picking up human signals, which is why carefully-designed experiments are important in ruling out the “Clever Hans” effect (named after a horse who, more than a century ago, amazed crowds with his apparent mathematic abilities, but who was ultimately found to be picking up on involuntary body language cues from his trainer). By eliminating visual contact between Chaser, Sofia and the experimenters and by adding controls such as having unfamiliar persons issue requests and moving around the objects, the researchers ensured that the dogs had to rely exclusively on words rather than on inadvertent human signals or other contextual clues. By changing the size, shape and color of the requested objects and introducing a new object (the teddy bear), the researchers were able to test whether Sofia was able to generalize and apply concepts to new objects in the same category. By reversing word order and thereby changing the acoustics of compound requests, the researchers were able to rule out the possibility that Sofia was performing based on memorizing the sound properties of requests rather than actually understanding the individual words comprising the requests. So, you were right all along – your dog really does understand you. The problem is everyone else. Pilley, J., & Reid, A. (2011). Border collie comprehends object names as verbal referents Behavioural Processes, 86 (2), 184-195 DOI: 10.1016/j.beproc.2010.11.007. Ramos, D., & Ades, C. (2012). Two-Item Sentence Comprehension by a Dog (Canis familiaris) PLoS ONE, 7 (2) DOI: 10.1371/journal.pone.0029689. Thorough review of the articles. I’m actually interested in the word order switch in the last article, could that just require more conditioning or did voice inflection play a role in indicating the purpose of each command, which changed when switched. I’d like to see another study examining that portion. Good point, Austin. As I understand it, there wasn’t any kind of drop off in performance when the word order was switched, which argues for an understanding of the individual components rather than conditioning, but I’m not sure about whether/how they controlled for inflection. I’m also interested in the reversal. Looking ahead to future work, I should think it would have been better to keep to one syntactic pattern so more complex ones that rely on temporal relationships can be added without confusion. I’m thinking of structures such as novel actor/action/object or indirect object reversals or other ways of relating more than one object. Bonobo Kanzi, say, can “put x in y,” and Lou Herman’s work with dolphins has used multiple objects and relationships as well. I agree, and would add that what I’d love to see is more work on a broader group of animals – it’s one thing to spend years working with a single “superstar” performer that has received all sorts of training, and another to see how much dogs as a species (subspecies) understand more generally.